Unlike Delhi and Mumbai, Bangalore is not really a shopping destination. We love our Commercial Street and are happy shopping there for weddings, birthdays, festivals and any time of the year really. But the city does have some stretches and neighbourhoods where street shopping is big. 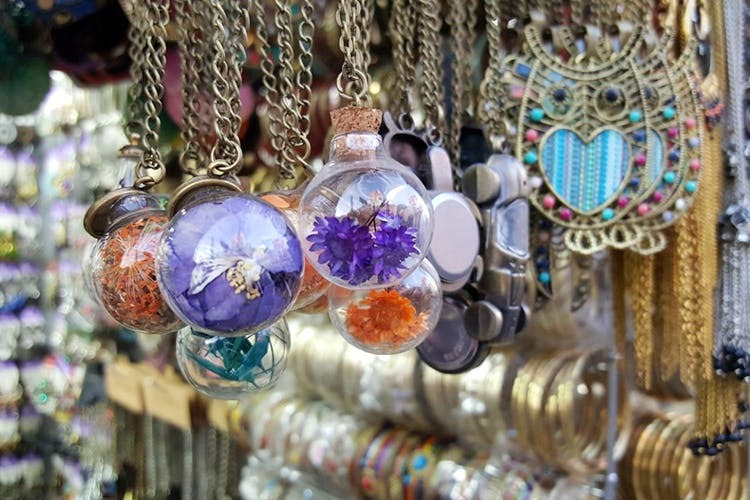 From budget apparel to funky shoes and jewellery to trendy bags, you can find everything on these street shopping trails in Bangalore. Though not as famous as Commercial Street, Jayanagar’s 4th Block has its own buzzing street shopping scenes going on. From readymade blouses to summery sliders, you will find everything here, and that too at budget prices. We have found cotton kurtas here for just INR 100 and readymade blouse pieces for around INR 250. There are also a decent number of stores that only sell men’s clothing with formal shirts, t-shirts and comfy reliable hoodies on their shelves, so no one feels left out here. Take your pick from ballet flats, strappy sandals, and juttis and chappals of every colour. There are also these Pick any sandal shops that sell shoes for as little as INR 100. This place also has all those extra fittings like tassels and ribbons to take to your tailor and add a little something extra to your clothes to make them stand out. Find out details about Jayanagar’s street shopping scene here. When you have a girls’ college in your neighbourhood, along with several eating out options, you are also bound to have budget, clothing and accessories shopping available in and around. Keeping true to tradition, the area around Jyoti Nivas College (aka JNC) has a shopping culture of its own. Frequented by a stream of college students on a daily basis, the streets of JNC are alive and bustling with energy plus offers some great options for retail therapy for the stylist on a budget. Take your pick from budget kurtis to trendy shoes and electronic accessories to make up. Want to find out more? Read here. The mother of all street shopping can of course be found on good ol’ Comm Street. Whether you are looking for embroidered saree blouses, or jhumkas to go with your ethnic outfits, Commercial Street never fails to surprise. Plus, them gold and silver Kolhapuris. If you are looking to do trends, then the best place they trickle down to is Commercial Street. The street also houses a bunch of export surplus stores, lots of street stalls for costume jewellery, faux leather bags, and even sneakers. If you are looking to get a complete wardrobe overhaul with some help from street shopping, then you can easily do it in Commercial Street. For more on Comm Street read here and here. You know you have come to the right place for street shopping, when you hit Brigade Road, located in the heart of CBD, off MG Road. From tiny stores selling export surplus clothing to cheap and cheerful shoe stalls, and funky jewellery (chokers and hoop earrings anyone? ), there is plenty to pick here. Looking for cool sunglasses? Then you can find everything from Wayfarer styles to cat eye ones. Brigade Road also has the popular Dubai Plaza where you can score trendy white kicks, bucket bags, and maxi dresses, all on a budget. Want your street shopping to come at stellar prices? Then, step out of Commercial Street and explore Shivajinagar. On OPH Road, you’ll find everything from blankets to sarees on a budget. There’s even a lane dedicated to trendy shoes that are available at throwaway prices. On the street opposite St. Mary’s Basilica, you can pick cane goods. And around the Taj Hotel area, you can find street stalls selling cottons and synthetics at reasonable prices. There’s even a thriving gujri market for furniture seekers.